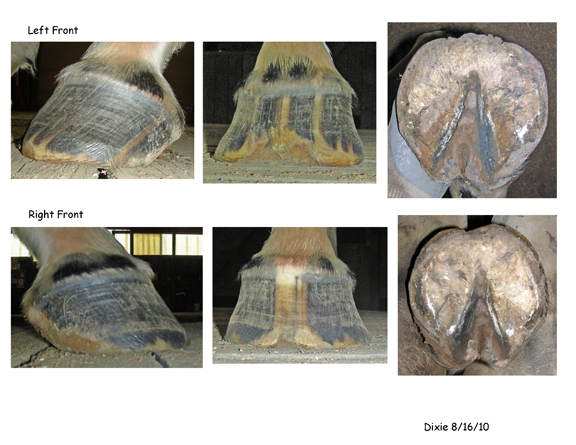 A photographic record of your horse’s feet over time is an important tool your hoof care provider can use to evaluate and to track changes, both positive and negative. Here’s how to photograph correctly so the images will not be deceptive. It may be helpful to have assistance. Take 3 shots of each foot: Dorsal (front), Lateral (outside) and Solar. Decide and record beforehand the order in which you will photograph each foot. Later when you download the images into your computer you will not be confused as to which picture is which foot. For example, I always take my photos in the same order. 1) Prepare a Clean, Level Surface. Bits of grass will obscure the view, and rocks can shift the angle of the foot, which will result in a shift of the structures that are being evaluated. I know it is not always possible to have the ideal circumstances for taking photographs, but with the best pictures, the most information can be revealed. 2) Stand your horse square in place. 3) Clean the foot. Use a wire brush to remove debris and wipe with a damp cloth if necessary, the goal being that all of the structures are clearly visible. 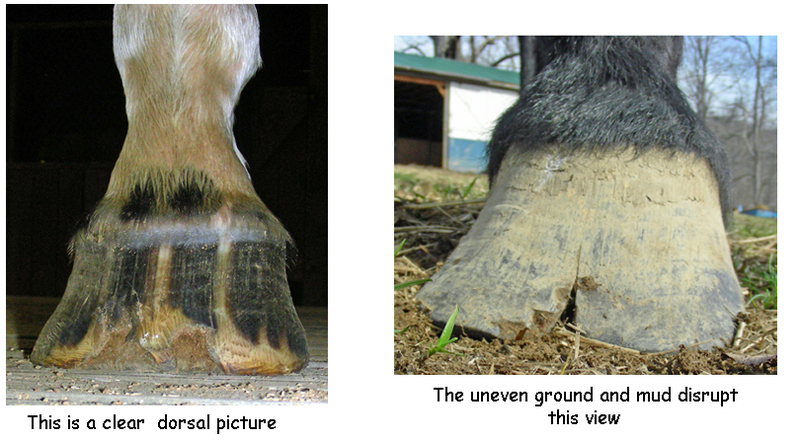 Place the camera on the ground parallel to the foot and include the fetlock. Be sure not to take the picture at an oblique angle. 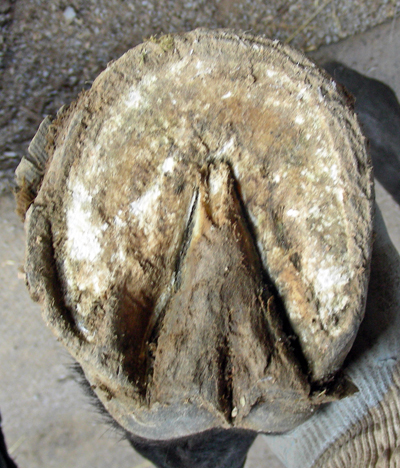 Place the camera on the ground directly in front of the foot and include the fetlock. When taking the solar view, the camera lens must be parallel to the sole. The traditional view of “sighting down the foot” will offer a distorted perspective and will not be useful. Be sure that the entire foot including the heel bulbs is in the frame. It is also helpful to have “full horse” shots. Take a picture of each side, one directly in front and one directly behind with the horse standing square. Save pictures for print at a resolution of 300 dpi. This prints well and provides excellent detail. You can also cut and paste the pictures, front on one page and hind on another. This is how I organize them for my records. If you plan to email them for an evaluation, images should be reduced in both size and resolution to a width of 4” with a resolution of 72dpi. and saved in jpeg format. This entry was posted in Educate Yourself. Bookmark the permalink. Both comments and trackbacks are currently closed.